Distributed energy generation system definition is not unique globally, and differs from country to country. Distributed generations (DGs) is similar to macro power grids, but the energy generation takes place on-site or near-site of the energy consumers. They are like power backups with low capacity of power generation, beneficial in times of grid breakdown. DG over the period of time has become part of distributed energy resources (DER), including the storage and even responsive loads. DGs are cost efficient, large grid alternative, eliminates transmission losses and uses other sources of energy. Environmental, regulatory and commercial factors are largely driving the market. Environmental by increasing use of renewable sources of energy, regulatory by the concerns over energy security and compliance of competition policy and commercial factors include cost effective and acceptance of small energy generation schemes. Moreover, the rising trend of micro grids has further opened the growth opportunities for distributed energy generation systems in APAC region. Countries such as China, Singapore, and Australia have setup micro grids and even DGs. Developing countries such as India are taking significant measures to promote the installation of DG with the efficient use of renewable energy sources. Goldstein Research analyst forecast that the Asia-Pacific distributed energy generation systems market is set to reach nearly USD 215.1 billion by 2024, growing at a CAGR of 14.9% over the forecast period (2017-2025). Micro-Turbines accounted for largest market share of 23.7% in 2017, closely followed by combined heat and power and PV systems. Application PV systems are expected to grow at a CAGR of 15.1% over the forecast period. Based on geography, China accounted for largest market share of 38.5% in 2017 due to its clear status on being the powerhouse of the APAC and global energy, especially in solar power generation. India is a fastest growing market majorly in the adaption of renewable sources of power generation and is expected to grow at a CAGR of 15.6% over the forecast period. The report covers the present ground scenario and the future growth prospects of the distributed energy generation systems market for 2017-2025 along with the market players’ analysis. We calculated the market size and revenue share on the basis of revenue generated from major players in the Asia-Pacific region. Asia-Pacific Distributed Energy Generation Systems Market Outlook 2017-2025, has been prepared based on an in-depth market analysis from farm market experts. 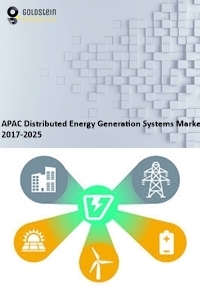 The report covers the competitive landscape and current position of major players in the Asia-Pacific distributed energy generation systems market space. The report also includes porter’s five force model, SWOT analysis, company profiling, business strategies of market players and their business models. “Asia-Pacific Distributed Energy Generation Systems Market Report” also recognizes value chain analysis to understand the cost differentiation, pricing models to provide competitive advantage to the existing and new entry players. Our Asia-Pacific distributed energy generation systems market report comprises of the following companies as the key players: ABB, GE-Alstom, Prysmian, Schneider Electric, Siemens, Burns and McDonnel, 3m, Power Engineering International, Sterlite Power, etc.